The National Park Service (NPS) seeks additional information to better understand the source(s) of groundwater and associated groundwater flow paths to Montezuma Well in Montezuma Castle National Monument, central Arizona. The source of water to Montezuma Well, a flowing sinkhole in a desert setting, is poorly understood. Water emerges from the middle limestone facies of the lacustrine Verde Formation, but the precise origin of the water and its travel path are largely unknown. Some have proposed artesian flow to Montezuma Well through the Supai Formation, which is exposed along the eastern margin of the Verde Valley and underlies the Verde Formation. The groundwater recharge zone likely lies above the floor of the Verde Valley somewhere to the north or east of Montezuma Well, where precipitation is more abundant. Additional data from groundwater, surface water, and bedrock geology are required for Montezuma Well and the surrounding region to test the current conceptual ideas, to provide new details on the groundwater flow in the area, and to assist in future management decisions. The results of this research will provide information for long-term water resource management and the protection of water rights. 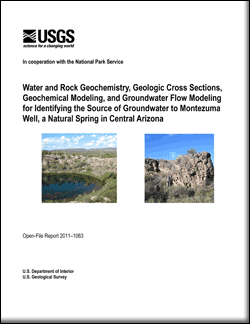 Johnson, R.H., DeWitt, Ed, Wirt, Laurie, Arnold, L.R., and Horton, J.D., 2011, Water and rock geochemistry, geologic cross sections, geochemical modeling, and groundwater flow modeling for identifying the source of groundwater to Montezuma Well, a natural spring in central Arizona: U.S. Geological Survey Open-File Report 2011–1063, 62 p.